Working in groups, create a meme transforming for the twenty-first century a quotation or idea from Douglas Coupland's novel Microserfs (1995). Sample topics include: a character's perspective, Microsoft life, the minds of computers, food, Jeopardy questions, and Daniel's diary. You can use any software, image, or platform, including Microsoft Word. When you have finished, email the meme to the instructor. We will assess the results together. 1. The film's representation of the intersection of art and technology. 2. The film’s demonstration of or difference from at least one point in the chapters we have read from Walter Isaacson’s biography of Steve Jobs, parenthetically citing the author and page number, such as: (Isaacson 31). 3. A response to a classmate’s tweet. Please either make a new Twitter account for our class or use an existing account. Working in small groups, make an infographic about the research methods in Issue 5 of Understanding Rhetoric. using Piktochart.com. Each group will focus on 1/5 of the chapter. Divide up the tasks among your group members. Group members can work on the design, mine the text, and determine how best to present the information. With ten minutes left in the class session, email the finished product to the instructor who will display it for the class. 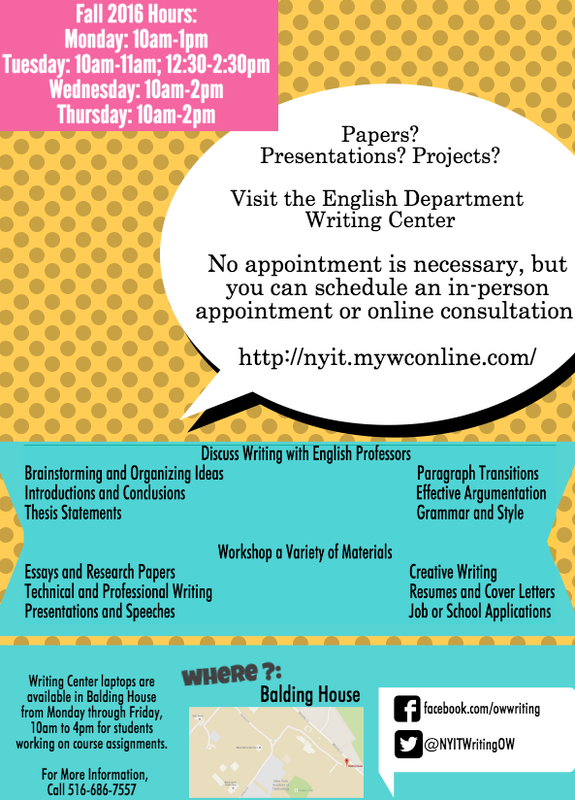 Using Canva, build from the discussion of logo design in Understanding Rhetoric to create your own logo, sticker, or promotional materials for the NYIT English Department Writing Center.